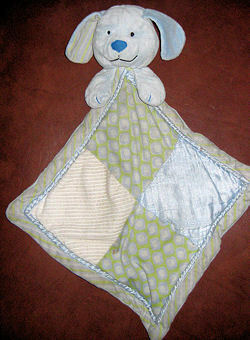 I am searching for a Manhattan Toy Company dog blankie type lovie. It is approximately a 12″ square of light blue plush fabric with a dog head attached to one corner (not in the center). The front of the square looks quilted with different material. I believe they were manufactured in 2004. On a recent trip to Disney World “Woofie” got left on the bed and swept up by housekeeping. Unfortunately, the hotel has been unable, or unwilling, to locate our son’s precious lovie. Hi – It has been so long since we lost this lovie, it is no longer missed. I almost want to buy it for sentimental sake, but I think I will leave it for someone else. Thank you for remembering I was looking for one. Would really love, LOVE to replace this for my son we lost one like it 2 years ago in Torquay UK. We keep thinking he has got over it but everytime he really hurts himself he remembers his ‘Dougal’. Please inbox me if anyone sees one.